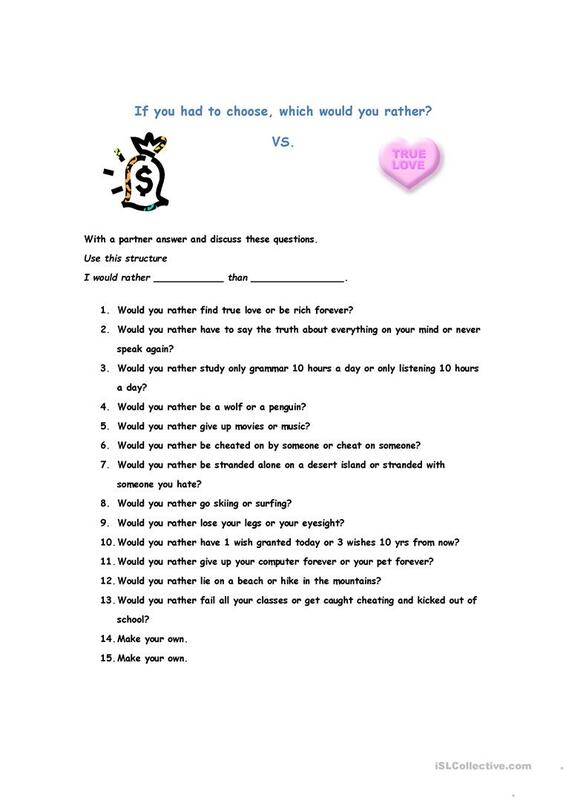 A worksheet for students to discuss preferences in the popular "Would you rather " type question. It uses the "would you rather" structure and promotes discussion. The above downloadable worksheet is intended for high school students and adults at Intermediate (B1) and Upper-intermediate (B2) level. It is aimed at teaching Modals in English, and is excellent for working on your groups' Speaking skills. whounsy is from/lives in Canada and has been a member of iSLCollective since 2012-03-13 02:51:14. whounsy last logged in on 2018-11-26 21:12:26, and has shared 7 resources on iSLCollective so far.